It was sometime before 1870 when James H. Douglas hitched his mule to steel tired wagons and rattled down the cobble stone streets of New Orleans, calling his new endeavor Douglas Public Service Corporation. Little did he know his modest dream would flourish and endure for over 100 years. In 1925, Douglas acquired a corporation known as New Orleans Storage and Terminal Company to handle bulk liquid storage to and from ships on the Mississippi River. The physical property included some 42 tanks, pumps and pipe lines with shipside docks for ocean going tankers and barges. 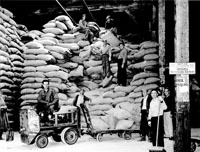 In 1931, Douglas Public Service Corporation became associated with Aero Mayflower Transit Company and acquired another multi-story building for the storage of household goods. 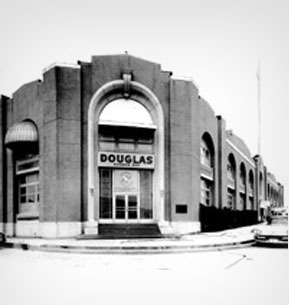 With far-sighted confidence, Douglas purchased the Guardian Warehouse Corporation in Chicago in 1931, which operated field warehouses in the central part of the United States, resulting in the establishment of Douglas-Guardian Warehouse Corporation in April, 1932. In 1986, James H. Leonard bought Douglas-Guardian and ran the company until his death in 1991. He would later be succeeded by Bruce Lurie, who became company president as well as a visionary for the rapidly evolving concern. In 1990, Douglas-Guardian bought the assets and accounts of Lawrence Systems, Inc. and Lawrence Warehouse Company. Douglas-Guardian also acquired the floor plan and equipment lease inspection accounts of Equifax Services, Inc. The addition of Equifax Service’s inspection business, allowed Douglas-Guardian to become a full service collateral control company. Under the leadership and guidance of Mr. Lurie, Douglas-Guardian evolved into a fully automated, state-of-the-art inspection and collateral control company. Many years have now passed since our inception. But one thing has remained the same; our commitment to quality, innovation, and true value for our customers. Douglas-Guardian is now a leader in the industry with over 300 employees serving customers in every state as well as throughout Canada. We utilize leading-edge technology, advanced logistics, and proven expertise to deliver exceptional risk management solutions. We know from experience that trust is built one service at a time. Douglas-Guardian welcomes the opportunity to demonstrate the quality and integrity of our work to you.